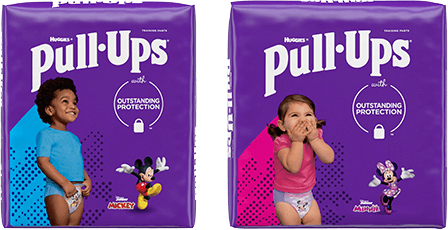 If your child is feeling confident, regularly making it to the potty before the arrival of the poop or pee, and often has dry, clean Pull-Ups®, it’s time for the next big step (drumroll, please): Big Kid Underpants. Your Puppy will respond positively to the change if she feels like her learning process and timetable are being respected, in partnership with Mom and Dad. Here’s how to handle this transition. Puppies like to know they are going to the potty the right way, and sometimes it takes a little time until they feel they are in control. If your child is ready to move on to underwear, great. If not, don’t push. Slow down and let your Puppy continue to enjoy Pull-Ups until she feels ready. It’s practically guaranteed that there will be some poop or pee ending up in this glorious new underwear– that’s just part of the process. Say, “Oops, we didn’t make it to the potty in time for this one. Let’s work together to put this poop in the potty where it goes, and then clean you up. Keep up the good work of trying to make it to the potty in time." The calmer and more relaxed you are, the calmer and more relaxed your little learner will be, too. You can also model language and self-talk when you need to use the potty. You may not think that your Puppy is listening, but he is. (Puppies are always listening!) "Hmm. I feel my tummy getting tight, I think I need to use the potty. Wow, I feel so much better now that I used the potty! Now, we can get back to playing/reading/watching TV." With potty training, your child is mastering a whole new skill set, so foster that joy of learning. At this stage, potty time is still a special time you have together.